A new photo of the giant asteroid Vesta snapped by a NASA probe reveals what may be one of the space rock's oddest features: three huge craters linked at the rim to form a cosmic snowman, scientists say. The smallest crater looks like the head of the snowman, with the two others making up the body, Holger Sierks, a member of Dawn's framing camera team at the Max Planck Society in Germany, said in a press conference Monday (Aug. 1). "They're very interesting to us because they appear to be shallow," he added. Dawn took the picture from a distance of about 3,200 miles (5,200 kilometers). 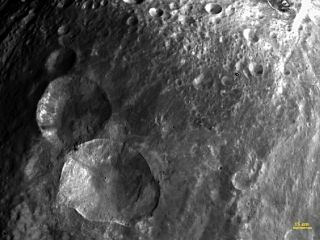 The snowman image is one of several new and detailed photos of Vesta that are being released as the spacecraft begins taking scientific observations of the space rock. The $466 million Dawn spacecraft entered orbit around Vesta on July 15 to begin a yearlong mission to closely study the asteroid. Dawn's close observations will help astronomers understand the early days of the solar system, the asteroid belt, as well as the processes that formed and shaped rocky planets like Earth, researchers said. Vesta, the brightest asteroid in our solar system, is the second-largest object in the main asteroid belt between Mars and Jupiter. The space rock measures about 330 miles (530 kilometers) across.